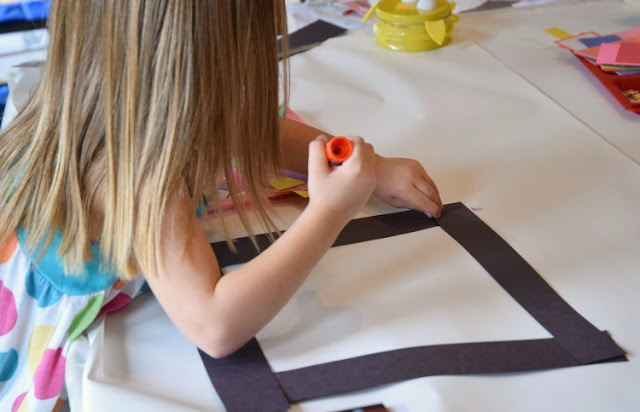 My girls absolutely love these Invitations To Create. 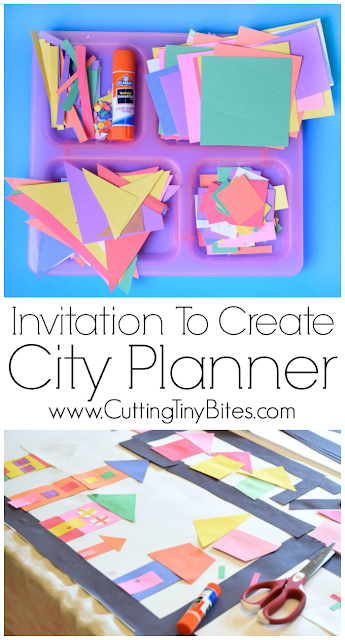 On the day we made this City Planner project, I gave them a choice of several crafts and activities that I had planned. They both immediately jumped at this one! I love these projects because my children get to develop their fine motor skills, but also be creative. 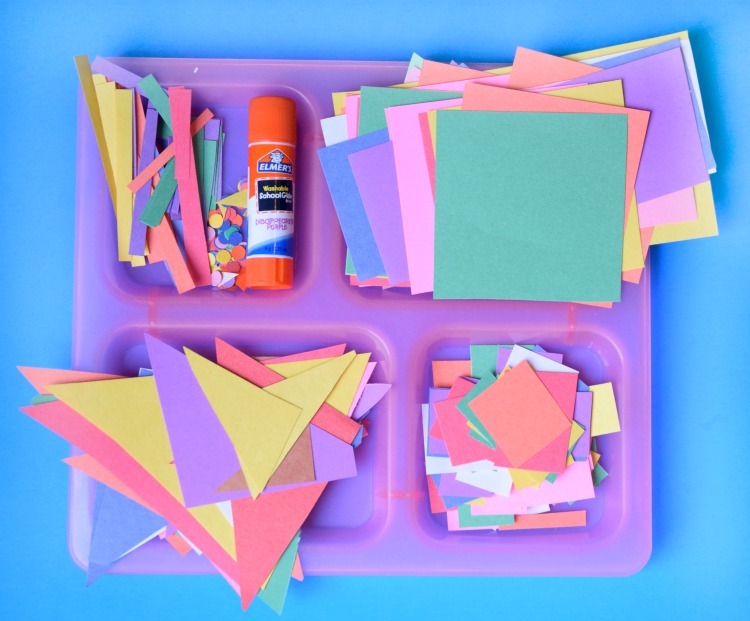 It's amazing what you can do with some paper and glue! 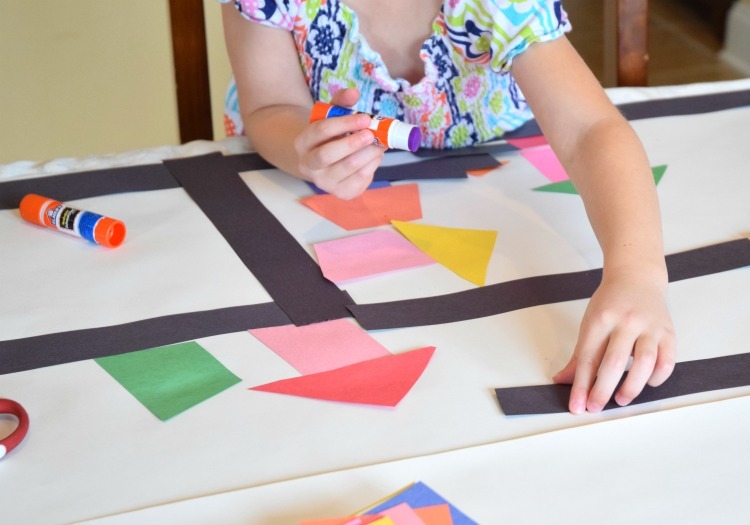 This project would be perfect for a construction, city, or building theme. Here's how to set it up! 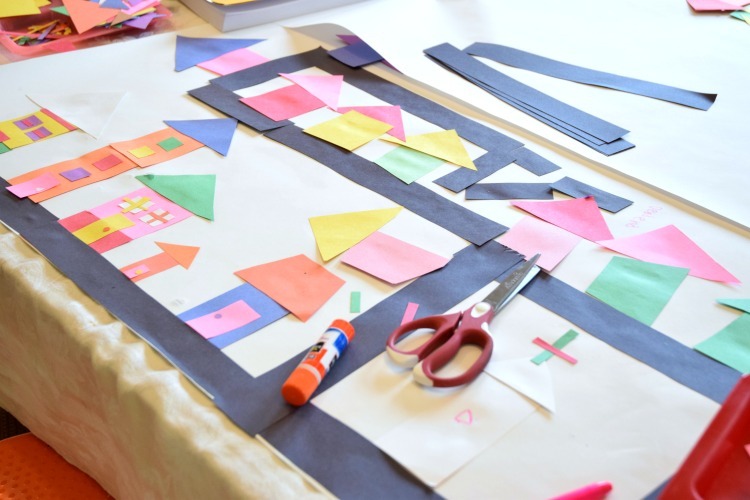 For this Invitation, cut large squares and rectangles of different sizes and shapes. You'll also need a variety of triangles to be roofs. Next, cut small squares and rectangles to be doors and windows. Finally, you may want some skinny rectangles and small circles (from a hole punch) to be window trim and door knobs. I even threw in a few trapezoids left over from our Cupcake Factory and repurposed some rectangles and dots from our Build A Bug activity! My girls quickly requested some "roads" for their city, so I just added a few long skinny pieces of black paper once they got started. Place your pieces into a divided tray, if you have one. It adds a nice touch, but is certainly not necessary. The ones that we use are no longer available, but these look pretty similar. Add a glue stick. Normally, we make our Invitations To Create on little quarter sheets of paper, but to make a big city, we needed big paper! Cover your work surface with paper. Invite your children to the table to make a city! 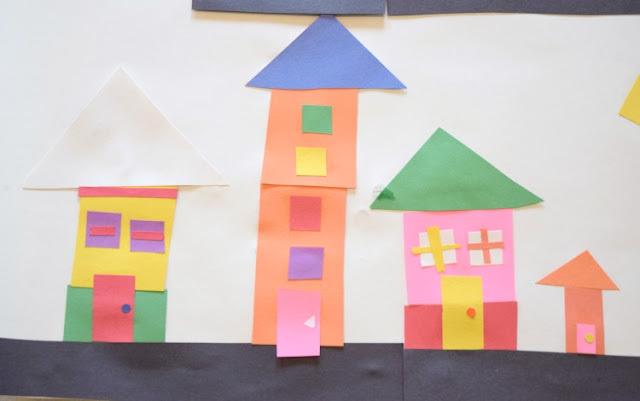 They'll use the different shapes and colors to make a variety of buildings and houses. Lena got right down to business, making a main road and several houses. Maggie started by building a "town square" which she then decided she didn't like. She gave to Lena. Instead, Maggie decided to make a tiny little mouse village. And no mouse village is complete without a church. Look at all that great fine motor work happening! She's selecting pieces from her tray, getting just the right amount of glue in just the right place, and then positioning the piece exactly where she wants it. Lena made a whole city, complete with plenty of roads and lots of buildings. She even incorporated Maggie's "town square" into her plans. Lena loves working on BIG art projects, and this one was no exception. She loves the creative aspect of this type of project and always surprises me with the things she figures out how to make with simple shapes. We worked together to add some details to the windows and doors until her whole paper was covered! Pretty great, huh? 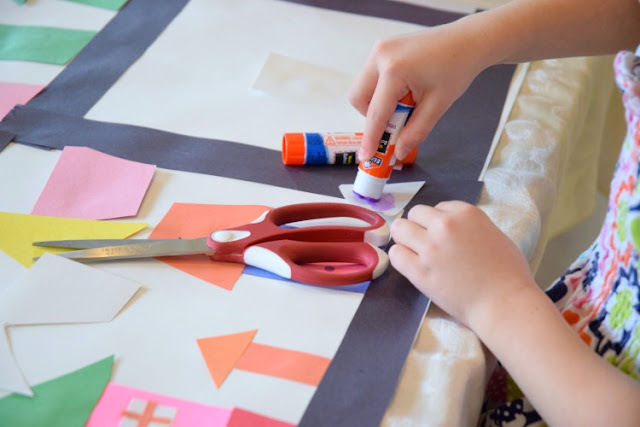 If your kids enjoyed this Invitation To Create, be sure check out these other variations! 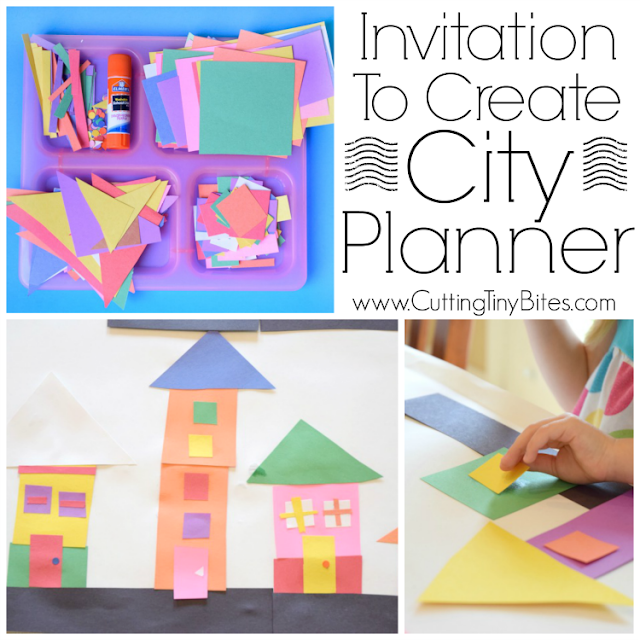 Invitation To Create: City Planner. 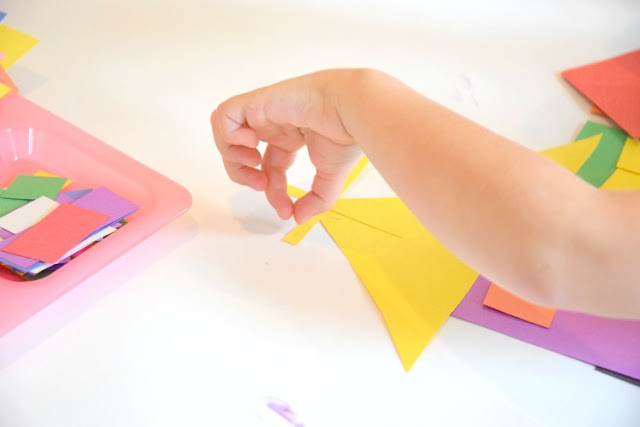 Open ended creative construction or building paper craft for kids. 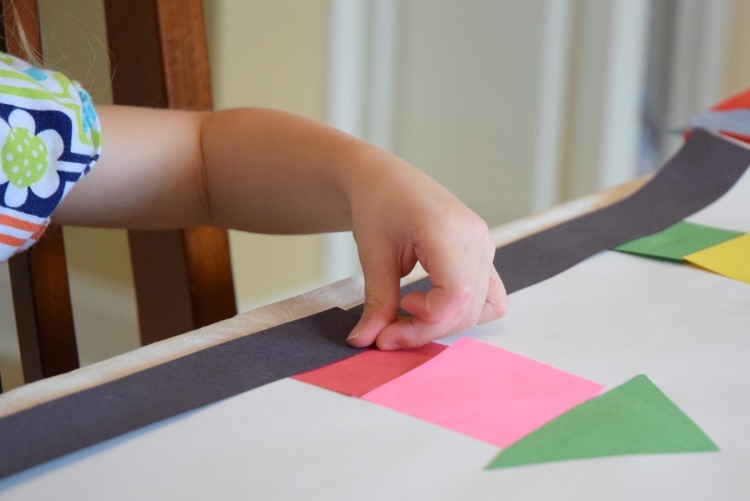 Great for fine motor development. 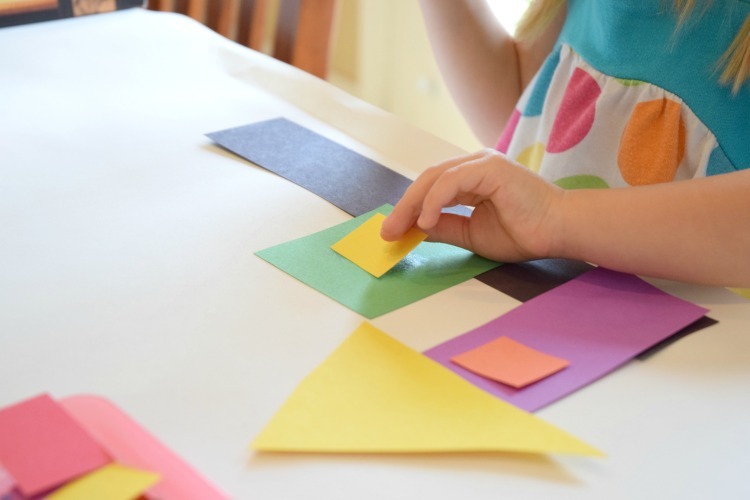 Perfect for preschoolers, kindergartners, and elementary students, and allows exploration of shapes and colors.